There is quite a few scenarios for re-styling clothing. 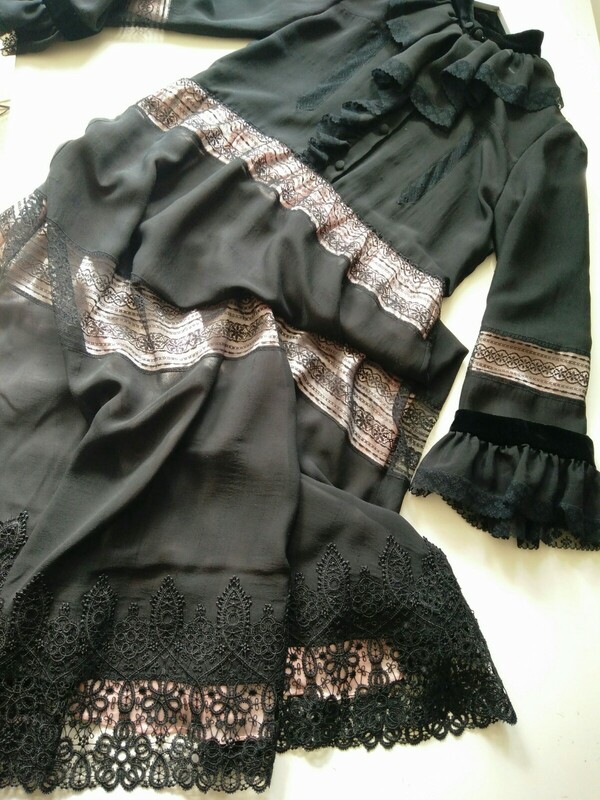 The look of the garment can be changed and improved by adding or removing details; changing the shape and propotion by cutting or adding more fabric; layering to give a new dimensions etc. 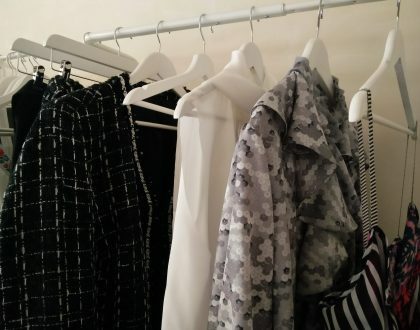 There is many reasons why it might be needed – garment can be old, out of trend, plain looking, not your style or liked for some features and not so much for other details. At the same time it is too good to get rid of. Re-styling will make a piece more personal as well as gives it a new life. 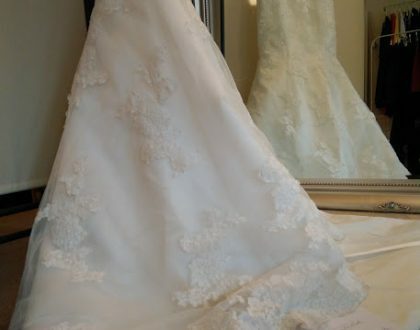 Quite a big trend these days is to up-cycle your wedding dress. It is a great idea, cause this is definitely one dress that is too good to only wear once. I’ve up-cycled few bridal dresses. Some have been more extreme transformations, some less. Shortening even does the trick. 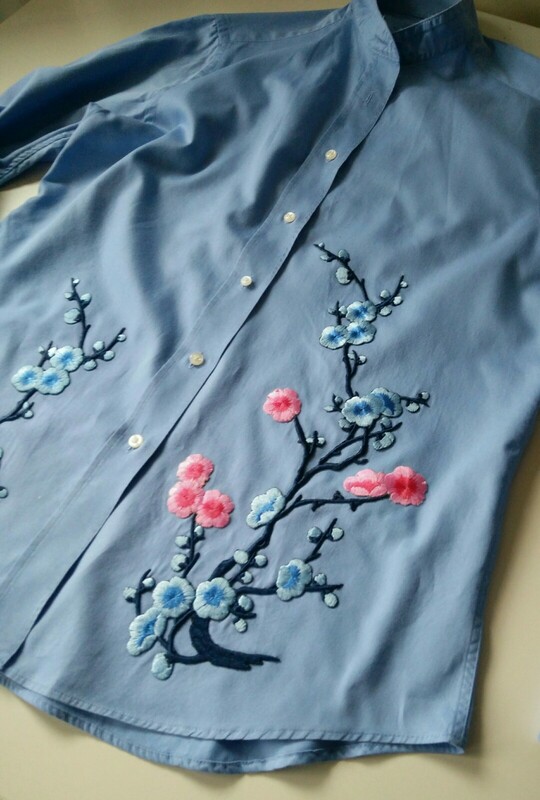 I’ve also added chiffon layers to the dress, decorated with colourful embroidery and added contrasting black lace motifs. The opposite – removing fabric – works too. I’ve stripped away all the bridal lace from the dress. Sans the lace dress got a simpler tailored look. Regular clothes sometimes need a revamp too. 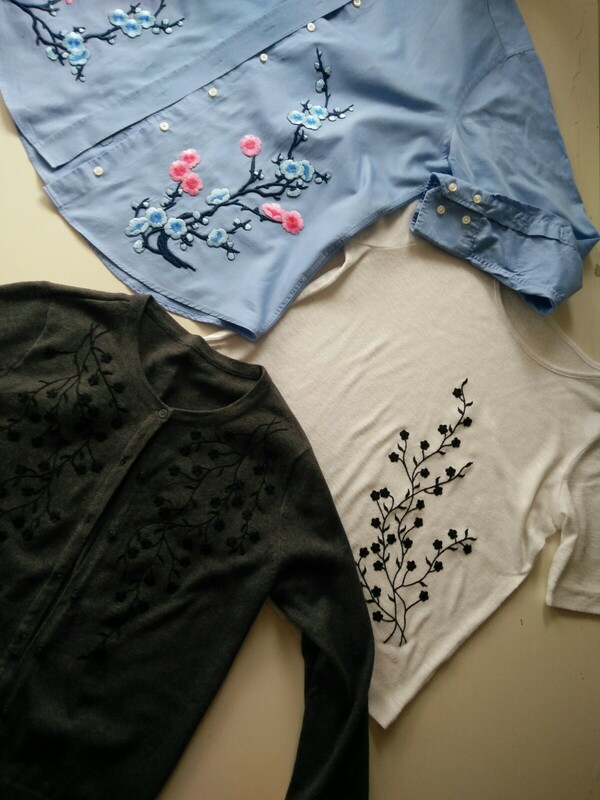 Basic styles like T -shirts, shirts, vest-tops, cardigans, simple sift dresses are the perfect canvas for some customisation. One of the easiest way is to decorate. 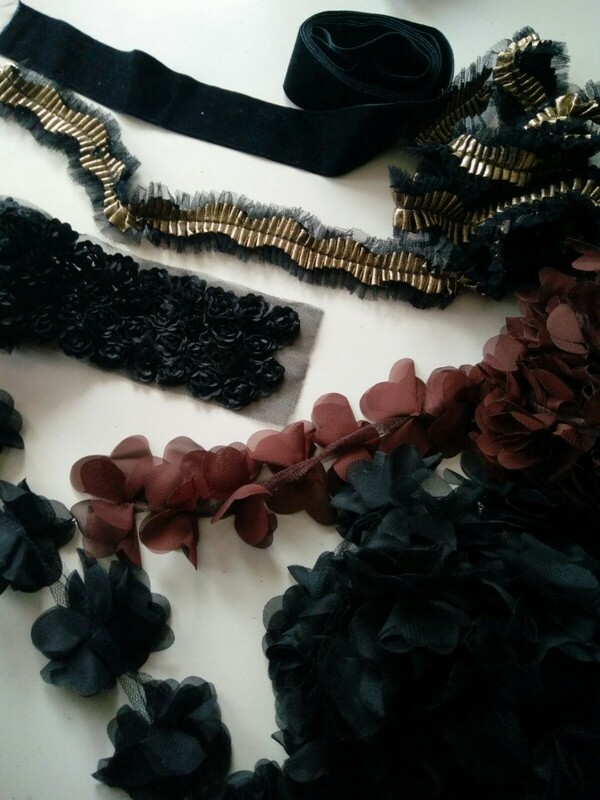 There is so many wonderful ribbons and trims available that can be added around neck, front, waist, hem or anywhere and way you like. 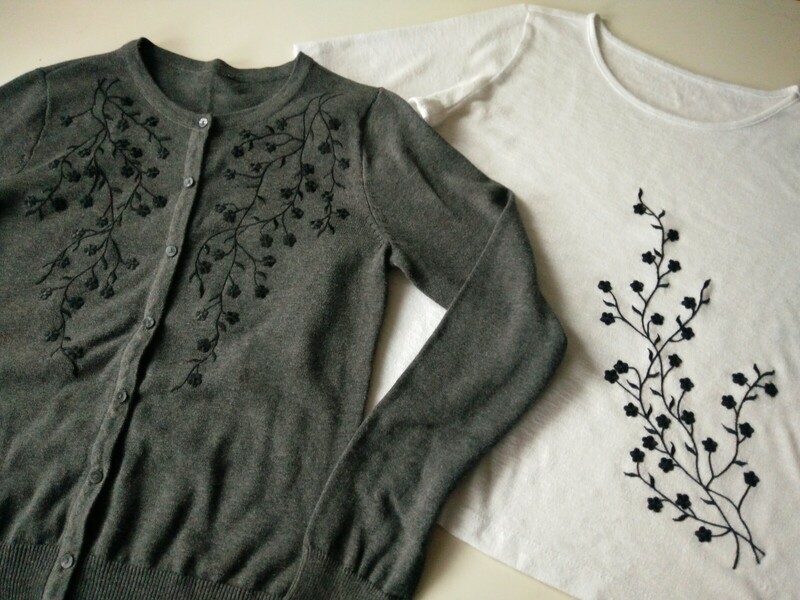 Here I’ve added embroidered motifs to the cardigan, top and shirt. Some motifs come with iron-on glue back and are easily attachable, but I think it is good to stitch them once over too. Placing the motifs on a garment is down to sense of composition and what you want to achieve. It does need some skill to make it look neat and last the wear and tear. 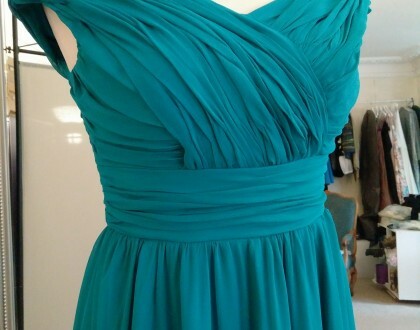 Sometimes a dress needs many alterations and only way to make it fit is thtough re-styling it. People generally associate altering a hemline with shortening a piece. But it is possible to lengthen too. This dress was too short and the seam at the waist sat too high. To extend the length of this dress , I sew a 5-inch-wide panel of fabric to the hem. I also inserted a waistband that made the bodice of the dress longer and made the waist sit in a right place. Inserting a waistband contributed to the length as well. By going for contrast (in color or texture) the extensions look intentional. Meant to be. 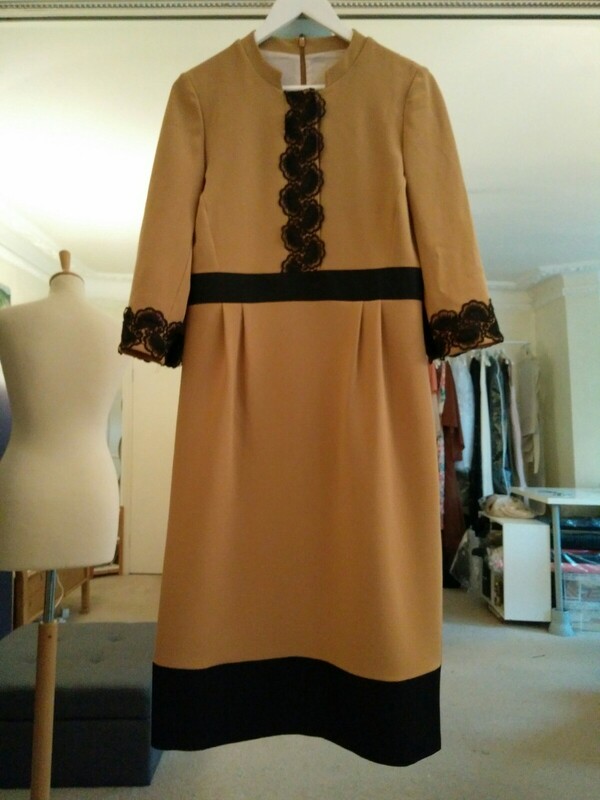 Another dress got a new look by a blush colour lining. All-black dress needed some up-lift and the black lining was removed and new made. Re-styling calls to visulize and experiment. With some proffessional help it is easily achievable too. With many years of experience altering almost every type of garment – whether that’s shortening or lengthening, taking in or letting out- I can give a updated fit and look to piece of clothing. Get in contact.